Be the first to share your favorite memory, photo or story of Timothy "Tim". This memorial page is dedicated for family, friends and future generations to celebrate the life of their loved one. Timothy (Tim) Wayne Dorl was born on December 31, 1961, in Perry, Oklahoma. 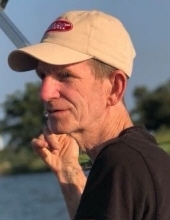 He passed away on Wednesday, November 28, 2018, in Stillwater, Oklahoma at the age of 56. Tim was born to Jack and Mary Ann (Edwards) Dorl in Perry, OK, where he grew up and graduated Perry High School in 1980. After graduation he began working on the farm for the Goldsberry family in Perry. He soon started driving a truck for numerous businesses hauling anything from fuel to agriculture all across the country that would span more than 30 years. Tim suffered from several serious strokes forcing him to retire earlier this year. Tim was married for 23 years to Paula (Walk) Litsey and to this union they were blessed with three children; Tabi (Dorl) Deal and her husband Toby, Trent Dorl and his wife Jenci, and Parker Dorl all of Stillwater, OK; Tim had three beautiful granddaughters, Laiken Deal, Maizie Deal, and Ralli Dorl. He is also survived by his brother Rick Dorl and his wife Robin of Glencoe, OK, and his sisters, Susan (Dorl) Burris and her husband Wayne of Smyrna, DE, and Lynette (Dorl) Luttrell and her husband Tom of Edmond, OK, and numerous nephews, nieces, and extended family members. Tim was preceded in death by his parents. Tim was a true family man and enjoyed spending his time with all of them. His three granddaughters were the apple of his eye. Always leaving “grampa” with a big smile. He loved driving his big trucks and spending time on the lake with his family making memories that will last a lifetime. Even at a young age, Tim never met a stranger. He was known as everybody’s friend. He will be greatly missed. The family would like to thank the staff at Brookdale Assisted Living, Physician’s Choice Hospice and Grace Living Center for their excellent care given to Tim. To send flowers or a remembrance gift to the family of Timothy "Tim" W. Dorl, please visit our Tribute Store. "Email Address" would like to share the life celebration of Timothy "Tim" W. Dorl. Click on the "link" to go to share a favorite memory or leave a condolence message for the family.